Deric's MindBlog: Brain activity associated with predicting rewards to others. Brain activity associated with predicting rewards to others. Lockwood et al. make the interesting observation that a subregion of the anterior cingulate cortex shows specialization for processing others' versus one's own rewards. Empathy—the capacity to understand and resonate with the experiences of others—can depend on the ability to predict when others are likely to receive rewards. However, although a plethora of research has examined the neural basis of predictions about the likelihood of receiving rewards ourselves, very little is known about the mechanisms that underpin variability in vicarious reward prediction. 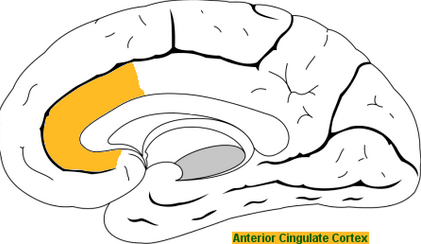 Human neuroimaging and nonhuman primate studies suggest that a subregion of the anterior cingulate cortex in the gyrus (ACCg) is engaged when others receive rewards. Does the ACCg show specialization for processing predictions about others' rewards and not one's own and does this specialization vary with empathic abilities? We examined hemodynamic responses in the human brain time-locked to cues that were predictive of a high or low probability of a reward either for the subject themselves or another person. We found that the ACCg robustly signaled the likelihood of a reward being delivered to another. In addition, ACCg response significantly covaried with trait emotion contagion, a necessary foundation for empathizing with other individuals. In individuals high in emotion contagion, the ACCg was specialized for processing others' rewards exclusively, but for those low in emotion contagion, this region also responded to information about the subject's own rewards. Our results are the first to show that the ACCg signals probabilistic predictions about rewards for other people and that the substantial individual variability in the degree to which the ACCg is specialized for processing others' rewards is related to trait empathy.